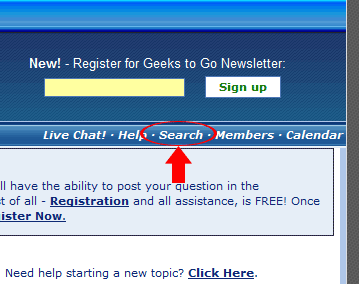 Please follow the steps below to use the Geeks to Go Forums. Soon you'll be finding free answers to your computing questions! Search. 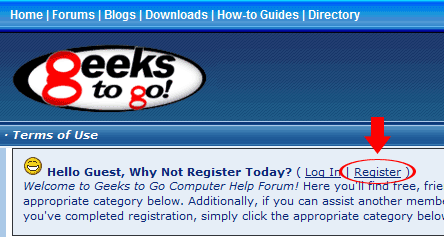 Geeks to Go has been offering free computer help since 2003 and has developed a large database of knowledge. In fact, chances are your question has likely been asked before. Before you post a question, please perform a simple search to see if you can find the answer. For additional help on search, click here. Register. Registration is free and only takes a moment to complete. To be able to use all the features on this board, including starting new topics, you must first chose a username and password. If you've already registered just skip to the next step. For additional help registering, click here. Choose a Category. The forums here are arranged into categories. This helps match your question with the people best able to answer it. Some examples of categories are Malware Removal - HiJackThis Logs Go Here (for spyware, virus, pop-ups), Windows XP, 2000, 2003, NT (for general Windows issues), Hardware, Components and Peripherals (video cards, RAM, overheating, etc), and Applications (trouble with software). After you've browsed all the categories and selected one, click on it to view the topics in that category. Please only post your question in one category. If necessary, you can request it be moved to another category later. Start a New Topic. After you chose your category (above), click the "New Topic" button. Post your Question Enter a short but descriptive title. Help us to help you! Use meaningful titles and descriptions, NOT just "help me". Describe your issues fully. List any issues and relevant error messages. Detailed posts get better (and faster) replies. For additional help on posting, click here. Reply. When your topic receives a reply, you will get an email notification at the email address used when registering (above). The email will contain a click-able link that will take you back to your topic. Add more information when requested, or if you think it will help. Resolved? 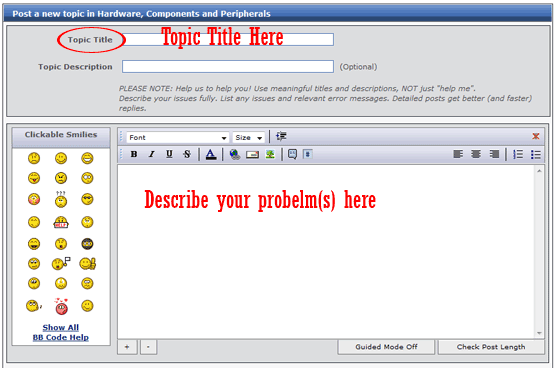 Please post how you resolved the problem. Your helpers appreciate the feedback, and someone who searches the board for the same problem will be grateful. No Answer? Post a topic in our special Waiting Room forum to let us know you've been missed. Do not ask for help involving any illegal activity, including P2P programs (Kazaa, WinMX, etc), CD keys, hacking, warez, etc. Please post your question only once! Duplicate posts will be closed, and create more work for our staff. Start a new post for a new question. Do not add on to yours or others. Be patient, it may take some time for a response. It is free. Advertisements, chain letters, pyramid schemes, and solicitations are inappropriate on this site. If you're here to spam, you will be banned without warning. Additional help topics available here. pls some body help me to remove the funny scandle.avi virus from my system. Hi and welcome to Geeks to Go! For help removing a virus, you'll want to head to the Malware section of this forum. Specifically, follow all the instructions in this link (click here). Step 5 will explain how you post a log. 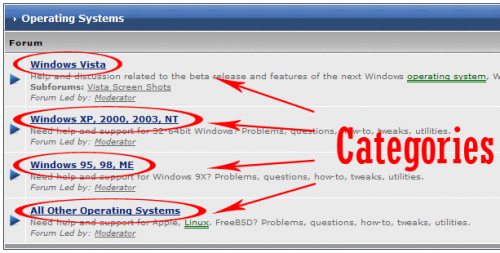 Make sure you start a new topic in the Malware forum (click here). Just beware the forum is very busy, please don't reply to your own thread as it will look like somebody is already helping you. If it is 3 days or longer with no reply, feel free to post a New Topic in the Waiting Room (click here). How I do reopen a topic? If it's been closed, you would need to send a PM to the staff member who closed it. If you can't identify who closed it, try sending the PM to a moderator or admin (be sure to include the link). If it was closed for a reason and is not for reopening, they'll let you know. Is it possible to delete one of my own posts or replys? If the thread isn't closed, though, you are able to edit your own post. Just delete the information you no longer want displayed. If the thread is closed, then you're stuck. Hi guys ^^, my second time (I think) around geekstogo and I've managed to get myself into a strange pickle =P.. anyhow I'm posting out here cause I'm faced with a dilemma. Yes mate it should be fine, just follow all the instructions in the thread and then post a log. Make sure to tell the helper you're just chasing a quick health check and they'll let you know if there's any nasties hiding in there or if you're running clean. I should think the Malware Staff would be fine with that. It was moved to the correct forum. Edited by missin, 19 May 2010 - 03:06 AM.